If the season ended today, the Arizona Cardinals would be the surprise top seed in the NFC with an 8-1 record and they would have home-field advantage all through the playoffs, including the Super Bowl which will be played at the Cardinals’ home stadium this year. But if the Cardinals are going to become the first team to play a Super Bowl in their home stadium, they will likely have to do it without their starting quarterback as Carson Palmer tore the ACL in his knee according to ESPN. What makes this injury even worse is that it came just two days after the Cardinals gave Palmer a 3-year, $US50 million contract with $US20 million guaranteed. 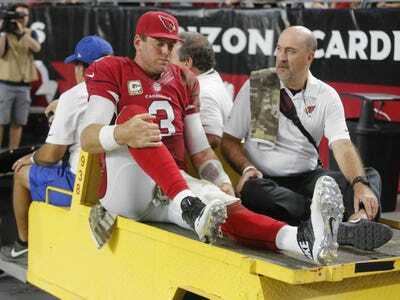 This was the second time in his career that Palmer injured his knee just days after signing a huge contract. In 2005, Palmer signed a 10-year, $US119.5 million contract with the Cincinnati Bengals. Ten days later, Palmer tore the ACL in his right knee on his first pass during a playoff game. Palmer did recover from that injury in time to start the next season but it would be four years before the Bengals would post another winning record. He would make just $US50.8 million of that contract before eventually being traded to the Oakland Raiders where he signed a new contract.